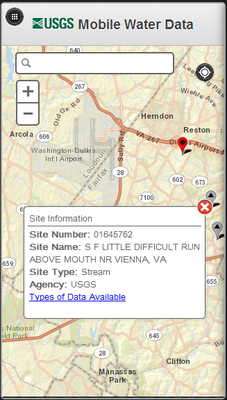 The new USGS Mobile Water Data site (m.waterdata.usgs.gov) is a site designed for mobile users. It highlights USGS current conditions water data. For example, you can use it to monitor conditions at a favorite river or stream. Any USGS current conditions water data is available. There is nothing to install. 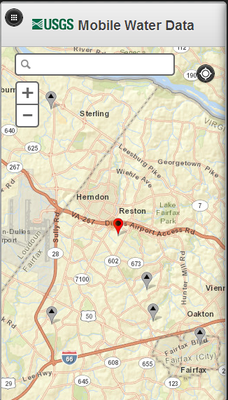 Simply use any browser to go to m.waterdata.usgs.gov. While the site was designed for smartphones, it may work fine on tablet computers, most other mobile devices and desktop computers. The site may not work on older devices or older browsers. The site is not designed for cell phones with tiny screens, that are text-oriented or that are not "smart". In general, you must be able to install an app on your mobile device to use the site acceptably. You may notice quirks and issues with older mobile devices or the latest mobile devices. Since the content on the site is for current conditions only, you may want to access the full USGS Water Data for the Nation. An easy link is provided to take you to the full site. This site is new so the USGS expect some issues to be noticed. Hence, this is a beta release. See reporting problems if you want to report recurring issues. When you first connect to the site, you will be required to acknowledge that the data are provisional before proceeding. After pressing OK, you are asked if you are willing to share your current location. 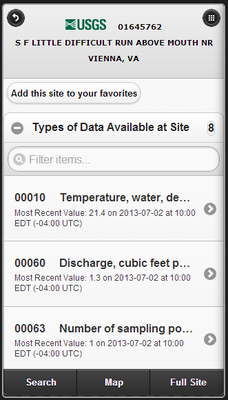 This is useful to show USGS current conditions sites near you. Sharing your location is not required. The color of the raindrops indicate the kind of site. Most are gray raindrops and indicate surface water sites such as rivers, streams and lakes. Full explanations of all the symbols used can be accessed through the menu button in the top left corner of this screen. Use the + button to zoom in and the - button to zoom out. If you zoom out too far, sites will disappear from the map or no new sites may appear. You will also see a warning message. For performance reasons, if the scale is too large it is impractical to show all possible sites on the device. Zoom in to an appropriate zoom level and sites will reappear. You can navigate east, west, north or south using your device. With most mobile devices this is done by dragging your finger across the map in the direction you want the map to move. There is also a search bar. Type "Albany" in the search box and execute the query and you are likely to see Albany, New York. If you are in Georgia, you may see Albany, Georgia, as it is closer to you. 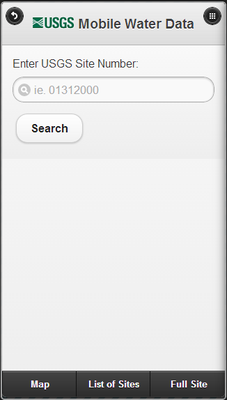 A sophisticated map search engine is integrated into the product. While sophisticated, you cannot use it to search by USGS site number of site name. If you type a geographical name there is a good chance you will see USGS sites near it. To see details on a site, simply select the upside down raindrop, usually by pressing on it. A pop up dialog box will appear with succinct information about the site including its name and number. Press on the Types of Data Available link to take you to a site detail page. On it, you can see all the various types of data (parameters) available for this site. The total number of data types is shown and circled. Since there may be many data types available, you may have to scroll down to see the data type that interests you. When on a site detail page, you can use the back arrow button in the upper left corner of the screen to return to the previous screen. You can use the menu button in the top right corner to take you to the menu. The site detail page provides the most recent measurement for each data type. To see the most recent 7-day graph of the data for a data type select the right arrow button next to the data type. 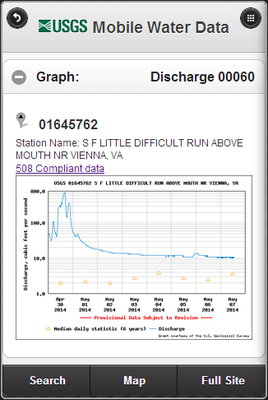 Note that by selecting the "508 Compliant data" link above the graph, the user is redirected to the USGS Water Data for the Nation page, where the data can be seen in a table. If you are visually impaired, this provides access to the data. With mobile devices, if you prefer more graph detail, orient your device to landscape mode and the graph will resize. Map takes you back to the map. You should be at the location you were when you clicked on the Types of Data Available link. While on a site detail page or types of data detail page, you have the option to save the site as a favorite by pressing the Add this site to your favorites button at the top of the screen. If it is already saved as a favorite, the button becomes Remove this site from your favorites. You can save as many favorite sites as you want subject to the memory limitations imposed by your browser and device. Favorites are saved on your device only. Help takes you to this page. This page includes information for how to report bugs and technical information about the site. Two of these options are complex enough to describe in more detail. To use this feature, you must know the USGS site number. Simply enter it and press Search. If successful, you will get the site's detail page. If it is incorrect, you will get an error dialog box. Site numbers are 8-15 digits. Surface water sites are typically 8 digits and groundwater sites are typically 15 digits. 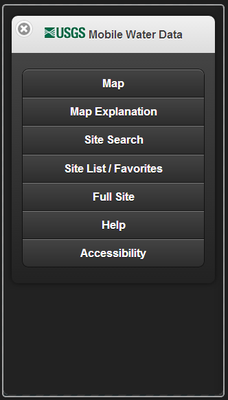 This option shows you a list of sites on the current map plus any favorites you may have stored. Select the + button to expand the list or - to contract the list. 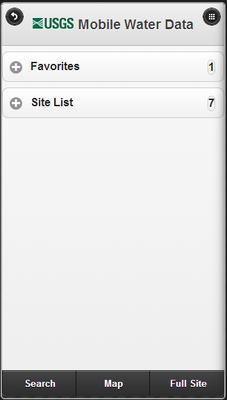 Once a list is expanded, select the site of interest by pressing the right arrow key to see details on that site. Before reporting a problem, please check our known problems page. There may be a workaround. A screen image of the error, stored as a file. See your device instruction manual for instructions on how to make a screen image. Here are some typical instructions for Android, iOS, Windows Phone and Blackberry devices. Operating system and version used. It's important to know the version you are running, such as Android's Ice Cream Sandwich. Here are some instructions for Android, iOS, Windows Phone and Blackberry devices. We will do our best to solve reported problems if we can replicate them. Send us email. While this site is in beta status, it is highly available. It is hosted redundantly at USGS hosting centers in Reston, Virginia; Sioux Falls, South Dakota; and Menlo Park, California. The site was developed by the employees of the USGS Office of Water Information.